Just last year, the beauty at the corner of Naglee and Dana was quietly fading away. Neglected, manhandled and choking on Roundup, the nearly 4,000 thorny residents of the San Jose Municipal Rose Garden were in distress, their blooms dying glorious slow-motion deaths. Then the rosarians stepped in. 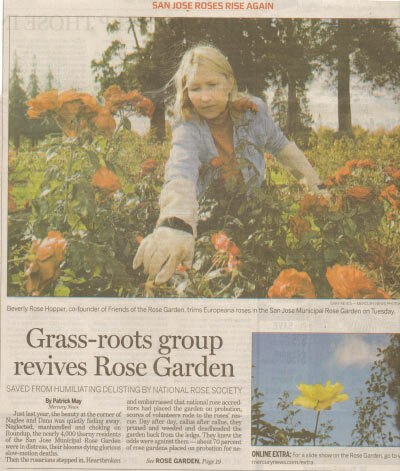 Heartbroken and embarrassed that national rose accreditors had placed the garden on probation, scores of volunteers rode to the roses’ rescue. Day after day, callus after callus, they pruned and weeded and deadheaded the garden back from the ledge. They knew the odds were against them — about 70 percent of rose gardens placed on probation for neglect never recover. This week, liberation came to full flower. In a ceremony Tuesday night in San Francisco, the rose garden was officially let out of the doghouse by the board of the All-America Rose Selections, the arbiters of good grooming for public rose gardens across the United States. hybrids a year before they become available to the hoi polloi — a big deal for rose-lovers. Even more, the rescue operation was a tour de force in grass-roots organizing, powerful proof of what city-citizen collaboration can accomplish. Due to a nasty mix of park department staffing cuts, ill-advised use of the weedkiller Roundup and general civic apathy, the declining quality of the plants led to its 2005 probationary status, a black eye that wasn’t made public until 2007. By then, cutbacks had left the park in shambles, with weeds growing higher than the roses. They grabbed organizing tools from every quarter: posting rose-pruning videos on YouTube, e-mailing a PDF newsletter to 500 homes and setting up a PayPal account for online donations. They trained an elite group of Master Volunteers (“wearing special vests so people passing by won’t think they’re just running around with shears,” said Hopper) and used everything from Eagle-Scout elbow grease to catchy marketing slogans to whip the roses into shape. By the beginning of this year, the efforts had translated into cleaner plots and fatter blooms, leaving the garden looking like it had been hand-colored by Carmen Miranda with a box of Crayolas. But more than anything, what Reilly and Hopper had really done was light a fire under scores of volunteer rose-lovers like Harry Garcia. A 65-year-old Willow Glen resident and avid gardener, Garcia had worked for years as a teacher for disabled students before retiring last June. Garcia’s story captures the love that this rose garden, despite intermittent lapses, has embodied ever since its groundbreaking in 1931. He’s out there every day for Melissa, his oldest daughter, who died June 6, 1995, from complications from lupus. She was 18, and despite receiving her dad’s transplanted kidney, “the best doctors in the world couldn’t save her.